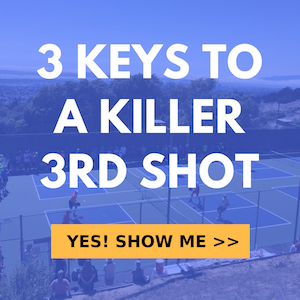 There are lots of reasons why a serving team may have trouble scoring in pickleball. Certainly getting up to the net as the serving team is difficult against a strong returning team but there are ways to handle it that will make your life easier and certain things that make your life way harder. The big serving mistake we describe in this video is one of them main reasons we see many beginning and even intermediate players get caught losing points. The good news is, there’s a very simple fix to it.